Home Unboxing Xiaomi Redmi Go Unboxing Review: The Perfect Android Go Smartphone? The Xiaomi Redmi Go is currently Xiaomi’s cheapest smartphone in 2019 which targets those on budget. 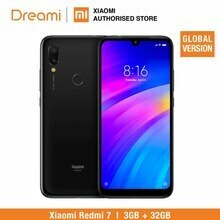 We just received a 1GB/8GB variant from leading online store Gearbest, where you can currently get the phone for just a token. It’s worthy to note that the Redmi Go comes in two storage variants, there’s one with 16GB if you want more storage and the standard base variant with 8GB. The 8GB variant relates more to those on extreme budget that wants to use a Xiaomi Product. When we got the phone, I decided to use it as second device for a few days. If there’s one thing I really enjoyed about the smartphone is the portability and 4G LTE connectivity. I also took the smartphone to the extreme by trying to test out its performance and prowess in terms of graphics and overall usage. We got the Global Version this time around, so you can actually see the orange sticker by the side. The Xiaomi Redmi Go comes in a white box with the “Redmi Go” inscription written boldly below in a gradient attractive color, while the Mi Logo is seen at the top left corner. Underneath, Xiaomi teased the attractive features of the smartphone which includes a 5″ HD screen with 720 x 1280 pixels resolution, Qualcomm Snapdragon 425, 3000mAh durable Battery, 8MP rear camera with f/2.0 aperture and a 5MP selfie. The phone sports a non-removable Plastic body. It’s either me or affordable smartphones has gotten more classy in terms of design. The Plastic body on the Redmi Go looks more premium and slippery, it could be mistaken for an aluminum alloy unibody. We got the Black colour variant, so photos might not really do justice to how beautiful it actually is in real life. It sports an 8MP rear camera and a LED flash at the top left corner which I will be testing out below. Disappointingly, the phone doesn’t come with a Fingerprint scanner or Face unlock, just the outdated Pattern & Pin method. To my surprise, it comes with two separate SIM slots by the Left side, one houses a single Nano SIM, while the other houses a single Nano SIM and a memory card. The right side houses the usual volume keys and power button, while the micro USB slot and loudspeaker sits at the bottom side. The top houses a 3.5mm jack, while the always important IR Blaster is obviously missing. As stated above, the Redmi Go features a 5″ HD 720 x 1280 IPS display, and a sharp 294ppi. However the screen stretches only up to 70% screen-to-body ratio with a 16:9 aspect ratio and lots of bezels. Have You Seen This? Xiaomi Mi Play Vs Redmi Note 6 Pro: Which One To Buy? Although, the bottom bezel houses the navigation keys, while the top houses the 5MP selfie camera and speaker grille. The fact that the phone can play HD contents at that price is very impressive. It’s powered by the Snapdragon 425 quad-core chipset clocking at 1.4GHz, runs on Android 8.1 Oreo Go Edition and has the Mint Launcher which is great, including all the Go apps. The GPU is the Adreno 308, so I actually tried seeing how powerful the phone can be and made a stop at the latest AnTuTu v7.1.5, including the 3D Benchmark and the phone just couldn’t process it. The latest AnTuTu v7.1.5 is obviously more graphics consuming than most phones with 1GB RAM perhaps. I also did a little trick by downloading the official PUBG Mobile APK on it and hoping it will process, it opened but there was a pop-up saying the phone couldn’t play the graphic condensed game. If it could install and process the official version, then I’m pretty sure it should be able to run the PUBG Mobile Lite apk version smoothly. The phone comes with an 8MP rear camera which really impressed me for this price. Xiaomi phones are known for its photography so I wasn’t actually surprised, we testified to this when we unboxed the Redmi Note 7. I also took some cute selfies with the 5MP shooter and it came out great with good lighting, although I’ve seen better. The phone is powered by a 3000mAh battery, I wasn’t expecting much in terms of power efficiency putting the chipset in mind. But I have to say, the battery wasn’t actually that bad and lasted as expected. It’s worthy to note that even though the phone came with a 5V/1A charger, it has some sort of fast charging feature which charges the phone faster than expected. The Xiaomi Redmi Go is currently trending on shopping stores as Xiaomi’s cheapest smartphone for the year 2019. It’s more than perfect for those on a budget and can also be used as a second device or a mobile WiFi Hotspot. Trust me, you can’t see the phone any cheaper than through the link below during this Flash Sale with free shipping to wherever you are. Samsung Galaxy Fold Vs Huawei Mate X: Which Is Better? ASUS Zenfone Max Pro M2 Vs Realme U1: SD660 or Helio P70? Samsung Galaxy M20 Vs Redmi Note 7: Which Is More Powerful?